A Volkswagen Golf blue-e-motion prototype electric car is the overall winner of the inaugural Future Car Challenge. The car also won its category, Most Economic and Environment Friendly Regular Passenger EV. The Royal Automobile Club Gold Medal for the winning vehicle was presented to Jim Holder, Editor of What Car? and Volkswagen engineer Folko Rohde who shared the driving. The pair joined a total of over 60 entrants in travelling from Madeira Drive in Brighton to Pall Mall in London – a distance of 57 miles – with the aim of consuming as little energy as possible. The Challenge attracted a diverse range of entries, from pure electric vehicles such as the Golf blue-e-motion, to hybrids, hydrogen fuel cell vehicles and highly efficient diesel cars such as the Polo and Golf BlueMotion. Powered by lithium-ion batteries, the Golf blue-e-motion has an electric motor with a peak power output of 115 PS and a range of around 100 miles in normal conditions. It can reach a top speed of 86 miles per hour and accelerate from rest to 62 mph in 11.8 seconds. The car features regenerative braking that can activate when the accelerator is released and during the initial travel of the brake pedal. This reduces the amount of energy that would otherwise be wasted during driving. Despite its unconventional motive power the Golf blue-e-motion appears at first glance like any other Golf with a slightly reduced boot volume of 279 litres and space for five adults. This is the first time that a Golf blue-e-motion has been brought to the UK. It was found to have consumed the least energy of any of the diverse range of vehicles in the competition from Brighton to London which took in a challenging mix of country roads, and some severe London traffic jams. 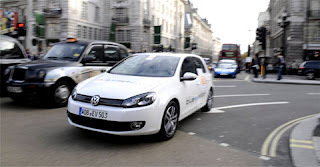 On arrival in London the Golf blue-e-motion had its data recorder removed by the RAC scrutineers and then joined the Polo BlueMotion and Golf BlueMotion entries plus all the other competing vehicles for a special display in Regent Street. Despite its conventional appearance this particular Golf attracted a lot of attention from members of the public, particularly when its bonnet was raised. On receiving the award, Jim Holder said: ‘It’s a testimony to the abilities of the Golf blue-e-motion that it won despite the fact I’d never competed in any sort of eco driving challenge before. Folko was a superb tutor in getting the best from the car, but the fact is that this was a challenge on real roads and, in my case, without an expert ‘eco’ driver at the wheel. That just underlines how efficient the blue-e-motion is now – so to think how good it will be when it goes on sale in three years time is extremely exciting. The Golf blue-e-motion is currently in the development stage. It is planned that it will be introduced to the market in late 2013.